The Black Forest Cake that I made 2 weeks ago. Eek! Well, I love a challenge almost as much as I love German cakes, and I quickly started looking up recipes and researching. You know what I discovered? 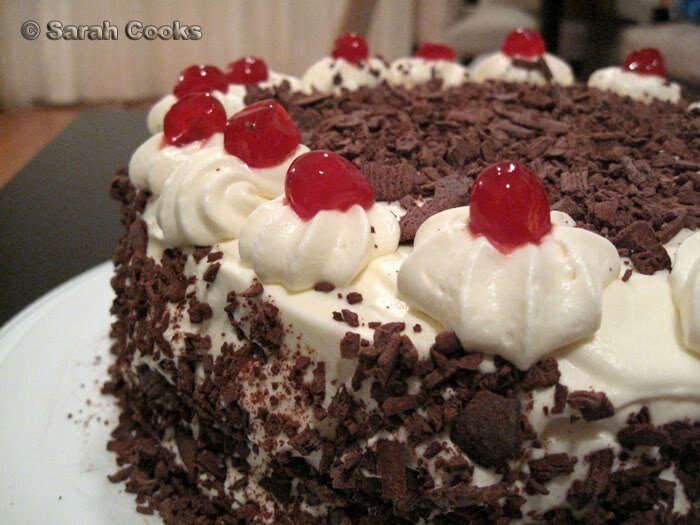 No-one makes Black Forest cake any more! Of the few recipes that I did find, most were deconstructed, modernised, adapted. 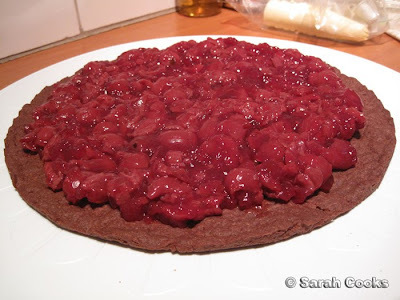 I also found lots of random dessert recipes which somehow involved the choc-cherry combo. But I wanted a properly German, traditional Schwarzwälder Kirschtorte. Not a pared-down, simplified version, not a trifle, not a cherry-flavoured chocolate biscuit! This also begs the question - why would anyone want to pare down the magnificence of this cake? Ultimately, I turned to my classic Dr Oetker Backen Macht Freude book, as it was pretty much the only Rezepte I could find for a klassische Schwarzwälder Kirschtorte. I was hoping to show y'all a cross-section of an actual piece of cake to show you what should be inside Black Forest cake, but unfortunately the cake got a little smooshed on the drive to Thanh's and the slices were super messy! Ta-dah! There are 3 main areas to which I'd like to draw your attention. The traditional cake includes a shortcrust pastry base, sour cherries, and most importantly, the whipped cream must include kirsch! Without the requisite cherry liquor, the cake won't taste right, and any Germans eating the cake to will be bitterly disappointed. Before Thanh's birthday, I was planning on doing a trial run of the cake, but in the general confusion of moving house I somehow got the dates mixed up. And so the actual day came and I just had to wing it. Uh-oh. I'll show you all the individual components (with a recipe! 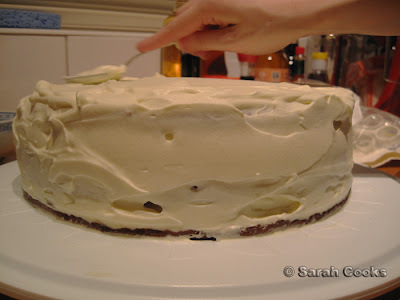 ), apart from the actual cake part, because it didn't turn out too well. But more on that later. I only managed to start baking at about 3:30pm... and the party was at 7pm that night! I should totally have started earlier; it would have saved me a lot of stress! 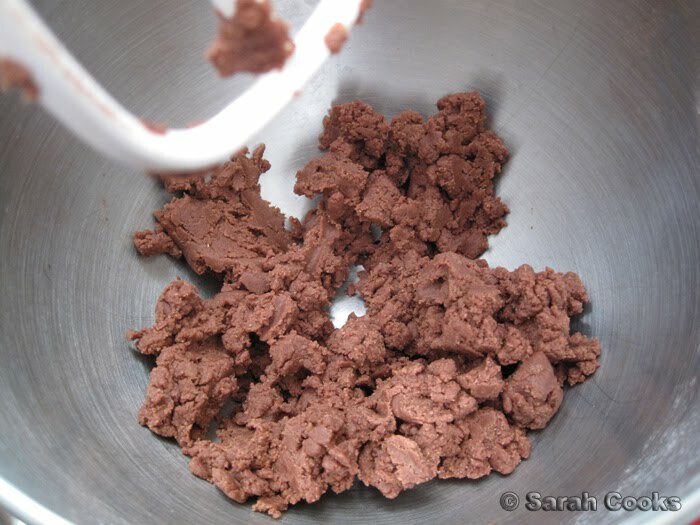 Sieve 125g plain flour with 10g cocoa and 1 tsp baking powder into a mixing bowl. Add 50g sugar, 1 pack vanilla-sugar, 1 tbs kirsch and 75g softened butter. 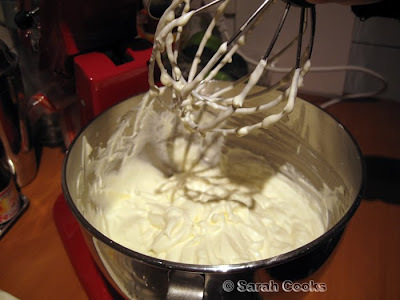 Mix using a dough hook or paddle beater until combined. 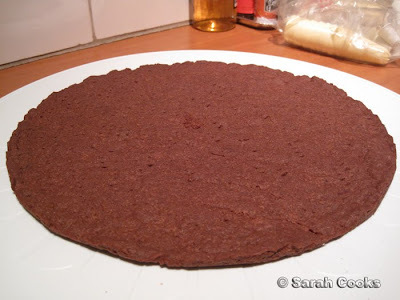 Roll out to a 28cm circle, and place into a lined 28cm springform tin. I still don't have a rolling pin at the new place, so I simply tipped the mixture into the tin, and pressed it out to fit. Poke the dough all over with a fork, as below. Make sure you check at 10 minutes! Because the dough is so thin, it burns quite easily. And in fact, I burnt the edges of first one I made, and had to rapidly whip up a second one. GRAR! Anyhow, here is the second, non-burnt pastry circle. With the first pastry circle, I broke off the burnt parts, and ate the good parts as a snack. And let me tell you, it was delicious! A smoky chocolate flavour, a short and crumbly texture - wow. It's certainly the easiest pastry recipe I've ever made. I think it would be good as the base for a tart, or even with ice-cream. Add the cherries and set it aside to cool. Once it has cooled, add 25g sugar and about 3 tbs Kirsch. Now, I don't know what went wrong with the chocolate sponge, because I followed the recipe exactly. But there was barely enough dough for the tin, and it ended up like a large flat pancake. The recipe then said "cut the sponge in half" - hah! By this stage it was about 5:30pm, and I did not have time to start researching other recipes. Instead, I made a double-quantity of the same sponge, which ended up being an appropriate size for 1 layer. Because it didn't work, I won't publish the recipe. I will just suggest you use a light chocolate sponge - one of those feather-light sponges where all the volume comes from beating whole eggs with sugar for 10 minutes - and emphatically not a buttery and heavy Victoria sponge. Delicious though they may be, you really need something light here, against all the cream and chocolate. Mix 1 pack powdered gelatine with 5 tbs cold water in a small pot. (Check your packet for instructions, as all gelatines vary in strength). Place on a low heat for 10 minutes, stirring until dissolved. Beat 750ml cream until almost stiff. 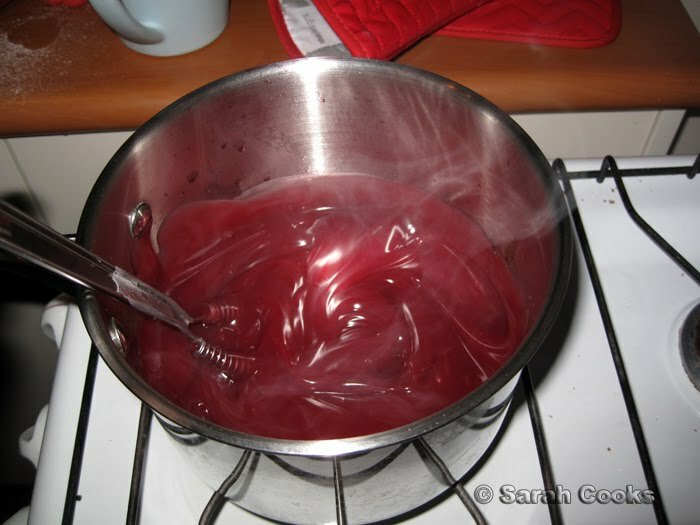 Then, slowly pour in the lukewarm gelatine mixture, whipping all the while, until the mixture is stiff. Add 1-2 tbs kirsch, sieve in 40g icing sugar and 1 packet vanilla sugar and mix in gently. A short note about the kirsch. As I previously mentioned, adding kirsch to the cream is absolutely essential for an authentic Black Forest cake. The kirsch I happen to have was a gift from the family in Germany. They have a massive cherry tree in the backyard, and each summer they take all that fruit and brew their own Kirschwasser. I know - OMG. They gave me a coke-bottle full of it to bring home with me from my 2007 trip to Germany. It's amazing, but it's too strong for me to drink by itself. To me, weakling that I am, it tastes like paint stripper. In the cake though, it is perfect. I did halve the quantities though, as I figured it would be stronger than store-bought kirsch. Cover with 1/3 of the whipped cream. 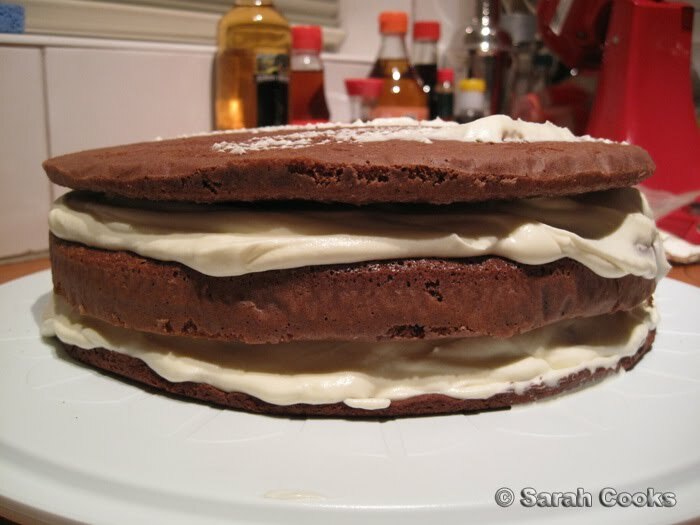 Place one cake round on top, and cover with 1/2 of the remaining cream. Place the remaining cake round on top. With the remaining cream, cover the top and sides of the whole cake. My recipe says to whip a further 100ml of cream to pipe rosettes on top, but I still had some cream leftover. Aah... doesn't it look pretty! 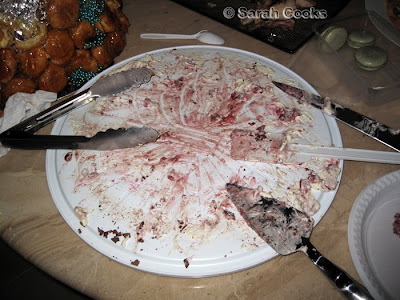 When we finished assembling the cake, it was already 8 o'clock. And the party started at 7. D'OH! No time to refrigerate the cake and let it set properly. We just had to quickly get dressed and get down to the party! Despite my most careful, cautious driving, the cake didn't look quite so pretty by the time it got to Thanh's house. Whilst it maintained most of its structural integrity, the cherries and cream started oozing out the sides and the cake layers slid a little bit. It was the most tense drive of my life! Sandra was holding the cake in its container, and we had the air-conditioning on to prevent the cream from melting any further. Good lord, it was cold! Big apologies to anyone who was stuck behind me, crawling down Springvale Road at 40 km/hr. But in the end, both of us and the cake got there. We unpacked it on the table (behind Lingy's delicious macarons and beautiful, flower-filled croquembouche), and I got stuck into the suckling pig! Mmm... suckling pig. Cutting it was difficult as well, as the cake pieces slid everywhere. It turned out to be a 5-person job, including liberal use of the Chinese waiter-two-spoon trick. Ultimately it all got cut up and passed around and eaten. I tasted some, and even though the sponge itself was a little denser than I'd like, the overall cake tasted good, and I breathed a sigh of relief. Phew! 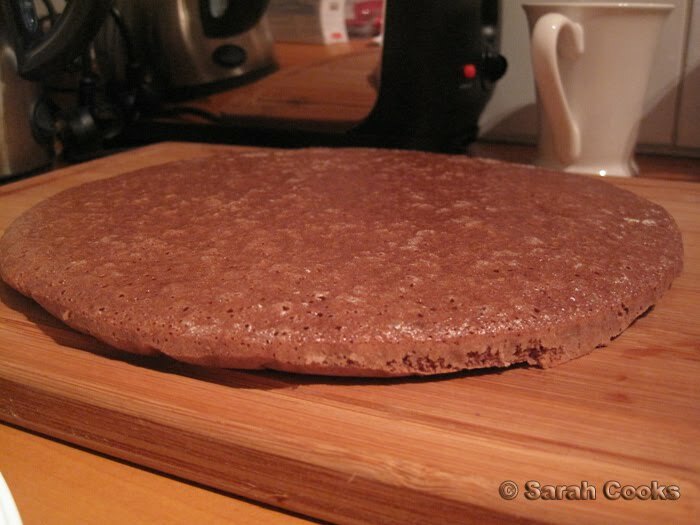 Apart from the sponge cake, all the elements of the recipe worked really well (especially that chocolate pastry - Mmm!). The sponge cake was the first recipe from Backen Macht Freude that hasn't turned out well. Next time I make a Black Forest cake, I'll experiment with a different chocolate sponge recipe. However, the key learning I took from this experience is that when making a Black Forest cake, the most important ingredient is time. Time to make all the separate components, time to assemble it, time for the cream to set, and time for all the flavours to meld together. I would definitely recommend making it the night before, or at least starting early in the morning. Next year Thanh, you are getting a gift voucher from Michel's! Mmmm I love black forrest cake. It has been my favourite cake since I was a kid and ate it at the Cuckoo Restaurant in the Dandenongs. Ooh, I know the Cuckoo restaurant! I've been there once with my family. I got a cute little "Otto" teddy bear too, hehehe. Sarah, it looks incredible! Kirsch cream concealed your struggles well. 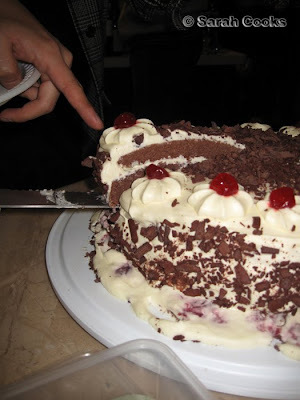 ;-) I had no idea that there was a shortcrust layer in a traditional black forest cake. Well done!! I wish I'd know you were looking for a recipe, though! My father, who cooks about once ever seven years, is known for his proper, traditional Black Forest Cake gleaned from a year living in Germany. But still, looks like you came up with something pretty wonderful regardless! Wow what an ordeal! At least it still turned out pretty good. Sophia - Omg I LOVE the Heston version! See, that's a non-trad version that I could totally get down with. Because he rocks and he understands what a Black Forest is all about (it is all about the kirsch). And the layers and textures just seem incredible and complimentary. I want to try his version but I don't think I can handle a vacuum bag, a whipped cream siphon AND a paint gun! But OMG the Masterchef version just looks horrible - mascarpone cream, ganache, chocolate mousse, 4 layers of sponge. Decadence for the sake of it, without thought for how the final product will taste. BLERGH. Why change perfection unless you're actually improving it, or at least doing something interesting with it? Hannah - Lol! That's so cool that your Dad can bake this cake! Must have been a rewardingly educational trip :D.
Mittens ate a piece at a well-regarded pub in Munich yesterday... and there was no Kirsch in the cream (just sprinkled on the bottom layer of cake). Tasty, but not the real deal. Wahhhhh amazing effort Sarah! Love those photos, advices and step-by-step recipes you give on your site. I actually made the MasterChef version for my god-mom's birthday :-b It wasn't all that bad. Anyone would love a cake for their birthday, especially a traditional German/ Austrian-inspired one!!! PS - I wasn't going to throw away your cakeboard! LOL. That was hilarious hehe. It was an epic great cake. It may have been oozing a bit but definitely tasted wonderful. Don't you dare get me a Michel's voucher. I hate their cakes. I'll settle for an opera cake next year. I'm sure it's a piece of cake for you, boom boom. I do my own jokes. OMG!! Finally someone posting the proper version with the biscuit base!!! My ex-husband is from the Black Forest, so i know what it should look like and taste like.... but after searching thru many, many recipes in disgust (not one of which had the yummy biscuit base in it! )I finally found yours...well done, and thankyou...now to get cooking!!!! Thanks for posting this recipe, I made it a few days ago for my school's baking competition and I won first prize! I used the chocolate sponge recipe that AustriaChloe suggested and lindt hot chocolate flakes to cover the cake and it turned out perfectly. Thank you!! AustriaChloe - thanks for the tip! I have a wonderful recipe from a magazine from many years ago. The recipe is from Lutz in Chicago. Just made it for my husband's 50th birthday yesterday. It has 2 chocolate layers and one yellow layer--which turned out beautifully spongy. Anonymous...Can you share the Lutz Bakery recipe? Born in Chicago, with a dad from Munich...I grew-up on this cake...along with their Hazelnut, Strawberry, and Mocha! I live in Northwest Arkansas now, and don't make as many trips back to Chicago as I'd like. I would love to make this for my dad's upcoming 81st birthday in May. My email is cmussar@uark.edu. Thanks for this great authentic recipe. I tried it yesterday and the family loved it. I especially liked the chocloate pastry base because it tasted great, gave an extra texture to the overall cake and also made it much easier to lift the slices out when cutting. Hello Sarah Cooks. No ides where you are located, but I'm in the states and will be making your cake this evening for my father-in-laws 70th birthday. What is the equivalent to a pack of vanilla sugar? I have vanilla sugar but it doesn't come in packs. Thank you and I loved your post. @lavienRose I'd substitute one teaspoon vanilla sugar for a packet. Alternatively you could use 1 tsp vanilla extract. I know you posted a while ago, but just want to say thanks ~ I did my own research too and I think I will try a couple things in addition to your recipe. 1) it seems that kirsch soaked sponge is actually a selling point (Germans like their alcohol I assume), which I figured out from Google translating German ads for the cake (the assembly looked just like yours by the way), so I think a little drizzle over each cake layer before adding the cream might be nice and 2) I've always hated the taste of maraschino cherries, but it seems like using kirsch soaked cherries (1 week) is more traditional anyways (although the color is dark and foreboding - maybe like the Black Forest?). Also, some reviewers on other recipes said it is very important to whip the eggs and sugar for a good 8 minutes (or until pale and thick), because the air bubbles are the only leavening agent, or else the sponge will turn out flat. I haven't tried any of this myself yet, haha, happy travels! One thing I would not have put into this recipe is the glazed cherries, that are on top of the gateau, I would have used fresh cherries, due to flavour. Also this recipe is adjustable so that it is suitable for Ceoliac patients. Any gluten free flour would be exceptable. so let's see what my german mother thinks of it :) I'll prepare it for her birthday... thank you really much for it but can you post another recipe for the cake rounds you used? Hi Julia - eek, pressure's on now hehe! Hmm a couple of the other commenters put links to recipes they had success with, perhaps give one of those a go? 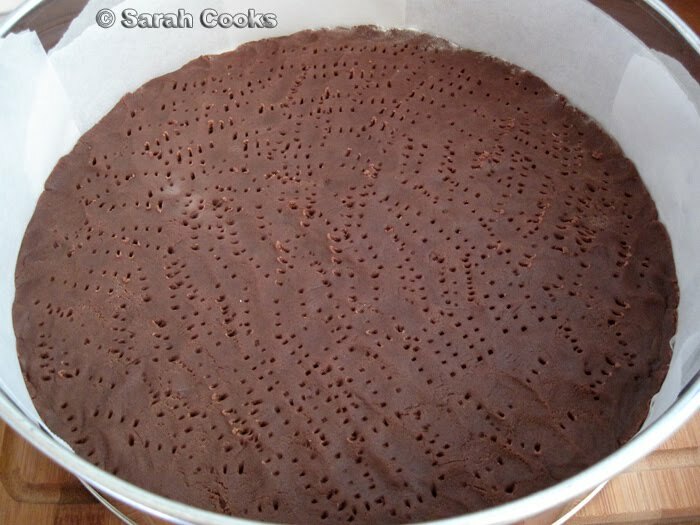 Alternatively, I *think* this one I found online could work well, as it's a light aerated chocolate sponge. However, I haven't tried it myself, so can't vouch for its reliability. Hope your black forest cake turns out beautifully! Good to see a biscuit base, ever since I saw Heston's show I don't think I could bake one without it. Did you moisten the sponge with syrup, I can't tell. Definitely gonna try the kirsch cream. Most Black Forest gateau recipes just seem to be covered in whipped cream but I'm gonna try it with gelatine and kirsch rather than just using kirsch in a syrup to moisten the sponge. Thanks for this it's really inspired me. Remember, this cake was not meant to be a super sweet dessert. It's meant to envelop all the richness of the flavors (adding the concentrated espresso does wonders!). 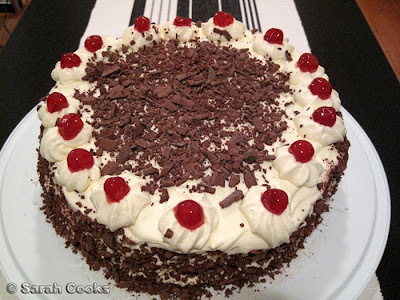 my fiance loves a blackforest cake and I can't wait to bake him one next week. :) I never knew a true blackforest cake calls for a pastry base, must try that, yums! Also, I'd like to know if the addition of gelatin to the cream will stablize the cream enough for piping? Say, if i were to use it for decorating a cupcake? I'm actually not sure if gelatin will make whipped cream stable enough to decorate a cupcake. It definitely helps when piping little rosettes on top of a cake, but I'm not sure if it would work to cover an entire cupcake as I haven't tried it before. Great job Sarah, could you please give the measurement in grams of the gelatin powder in packet in Australia? I think I found the same recipe online as you did. I also had to make a second sponge layer. I really think that recipe should have been PER layer. My cherry layer was leaking liquid around the base before I was done assembling. I used the same amount of cornstarch and a lot less juice, but the juice the cherries released after cooling was never absorbed. I did use fresh cherries instead of canned. I have my grandmother's and godmother's ingredient list (that I can make no sense of), so now that I have tried this version, maybe I can refer back to theirs and make changes that will solve the problems I had.